Mix all ingredients in a food processor until all ingredients are pureed. Then, slowly add the olive oil to the mixture. Allow to stand for one hour before serving. While the hummus is resting, slice vegetables of your choice using your food processor. 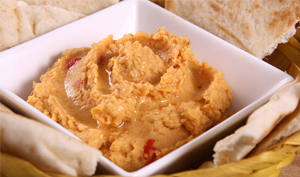 Serve hummus with fresh vegetables and pita for dipping.